Diaphragm walls (DW) are cast in-situ reinforced concrete elements, constructed end-to-end and widely used to build deep retaining walls - open trenches in the ground or deep basements. Diaphragm walls are commonly used for the world largest and most difficult below-ground projects, from the early example of the “bathtub” at the World Trade Centre in New York, to more recent examples in cities as Copenhagen, London and Amsterdam, where these walls form the station “boxes” and tunnel portals for recent metro and underground rail projects. DWs are constructed by completing individual rectangular reinforced elements (panels) one at a time, to form a continuous wall. 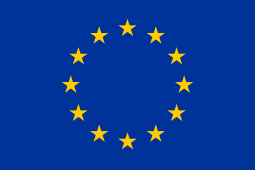 The vertical boundary between two adjacent panels is called “a joint”. Diaphragm Wall structures can have hundreds of joints; relatively small defects can have a marked adverse effect on the performance of the DW. The consequences of poor quality joints can be disastrous, with risk to peoples’ welfare and adjacent infrastructures. 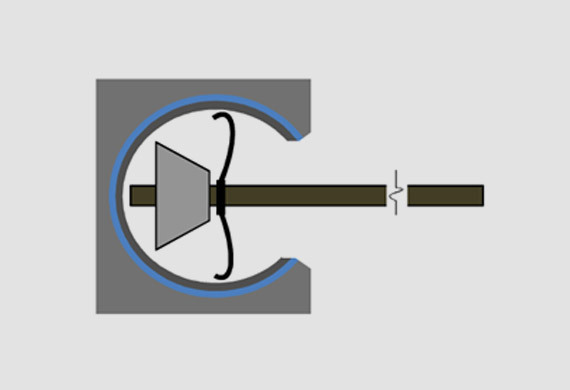 Traditional methods to construct DW joints are reliable, but generally only to depth of 30-40 m, according to the different techniques and care applied (even if they are weak in transferring shear stresses. Current DWs are typically 40-60m deep - this increase in depth raises the question as to how the integrity of the joints can be guaranteed to these greater depths. 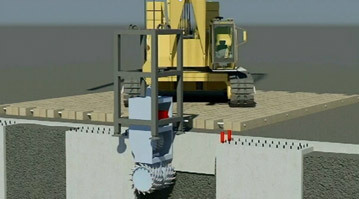 The TTMJ system offers the possibility to construct “perfect” joints to greater depth, following the profile of the primary panel with a mill (the joint trimmer) that is guided by tracks previously cast into the primary panel (after the secondary panel has been excavated and before it is concreted) ensuring the quality of the joints in the completed DW. The basic work stream it is summarized below. Primary panels are installed first. Two guide tracks are attached to each end of the reinforcement cage installed into these primary panels – adjacent to the location of the panel joint. This schematic shows a primary panel being concreted. When the concrete has gained sufficient strength, the adjacent secondary panel can be excavated. After excavation, the TTMJ Trimmer (guided by the tracks cast - the two red pipes in the figure, in the primary panel and therefore not subject to concerns of differential verticality tolerance between the primary and secondary panels), planes 20mm to 100mmdepth of concrete from the ends of the primary panel producing a profiled construction joint. After trimming of the primary panel joint surface, the reinforcement cage can be placed and the concrete poured, in order to complete the secondary panel. The TTMJ Trimmer planes the concrete from the end of a diaphragm wall primary panel to form a profiled joint. Guides attached to the body of the Trimmer run in the guide track maintaining its vertical alignment of the milling wheel relative to the primary panel, and ensuring that the Trimmer cannot move away from the concrete surface. For most applications, the guide track will have a typical concrete cover of 50mm. 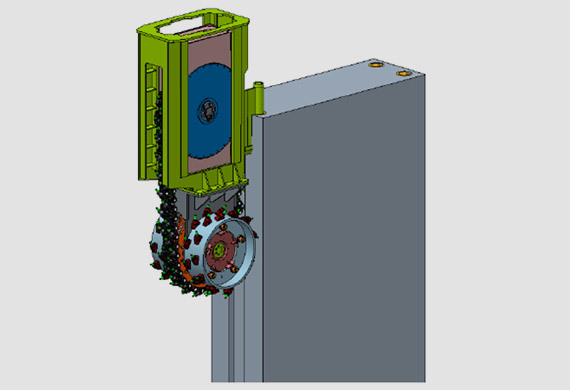 The Trimmer will incorporate a shear key. The TTMJ guide track system can provide a significant tension or shear capability across the joint. 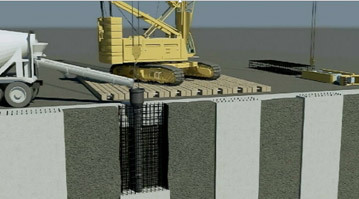 Anchor bars fixed to the reinforcement cage of the secondary panel can be located in the guide track and then concreted in position – providing a tension connection between the primary and secondary panels, across the joint. Previous attempts to provide tension capacity in this way has proved problematic! Milled joints typically do not contain water bars and there is no necessity to incorporate a water bar in the TTMJ Milled Joint. However, a water bar can be provided with the system incorporating a profiled water bar with hydrophilic cord which expands to seal the joint. further developments with deep shafts and piled retaining walls. 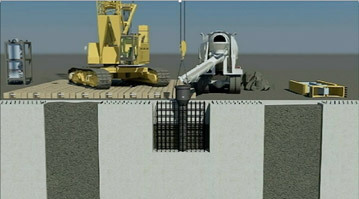 Ability to construct ‘tighter’ (smaller-dimensioned) diaphragm wall shafts (reduced land-take) than currently possible.